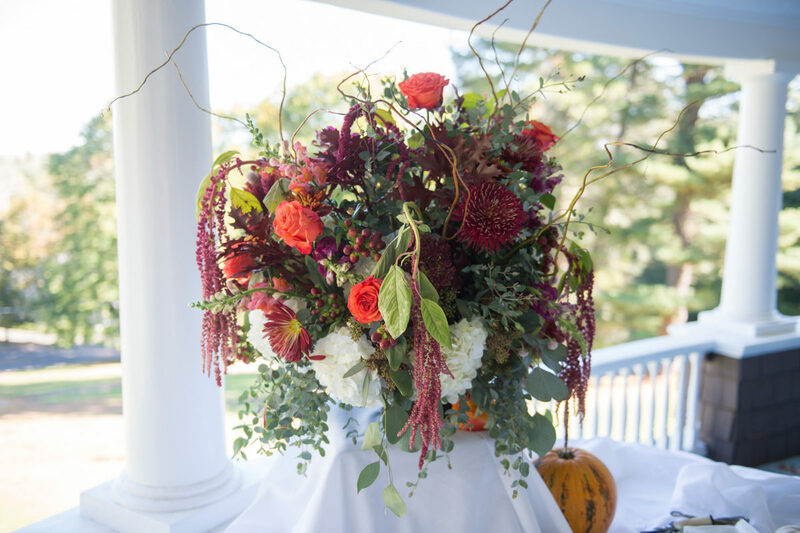 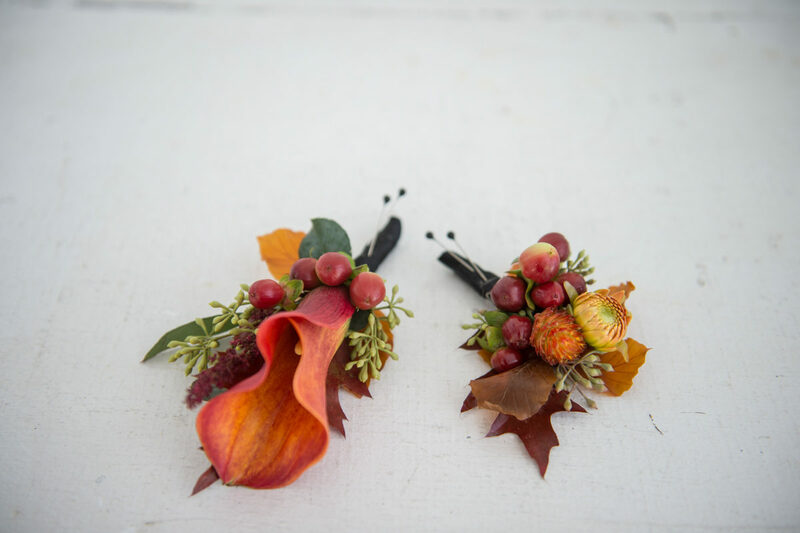 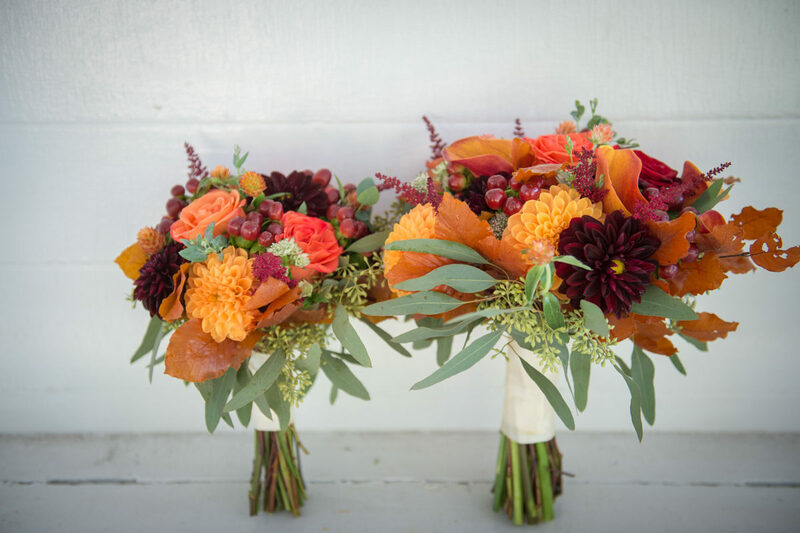 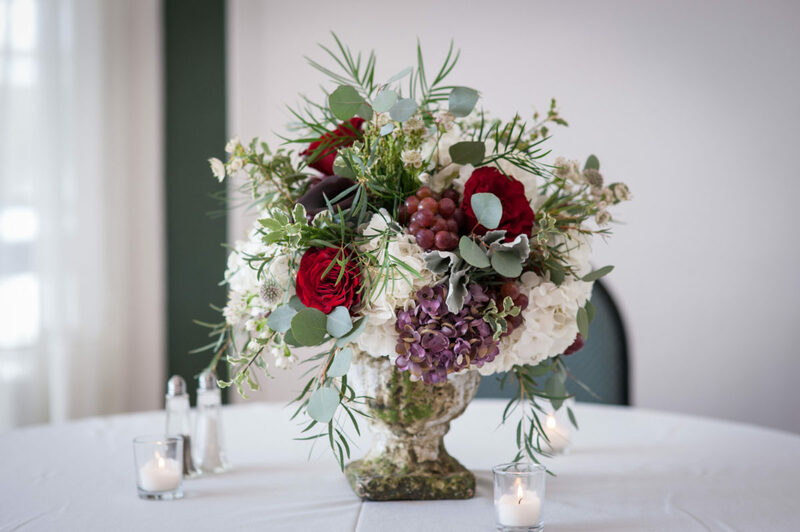 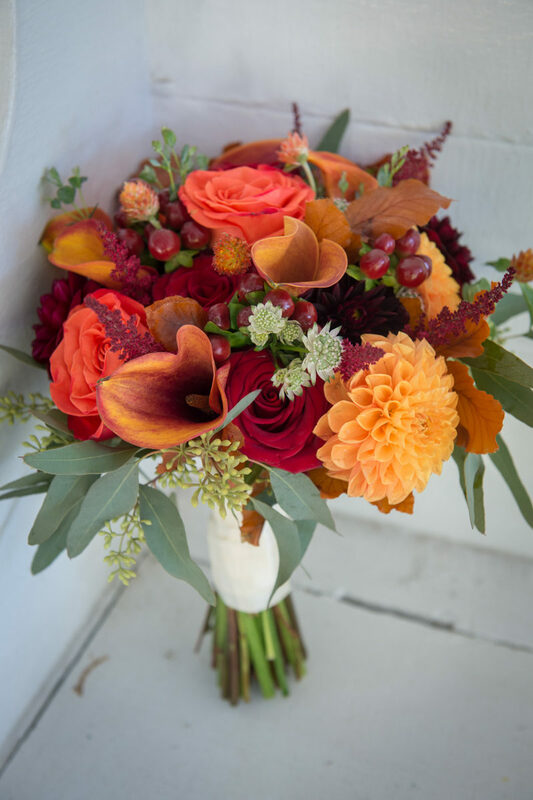 This weeks vendor spotlight features the amazingly talented floral designer Diane Gaudett, owner of Custom Floral Designs. 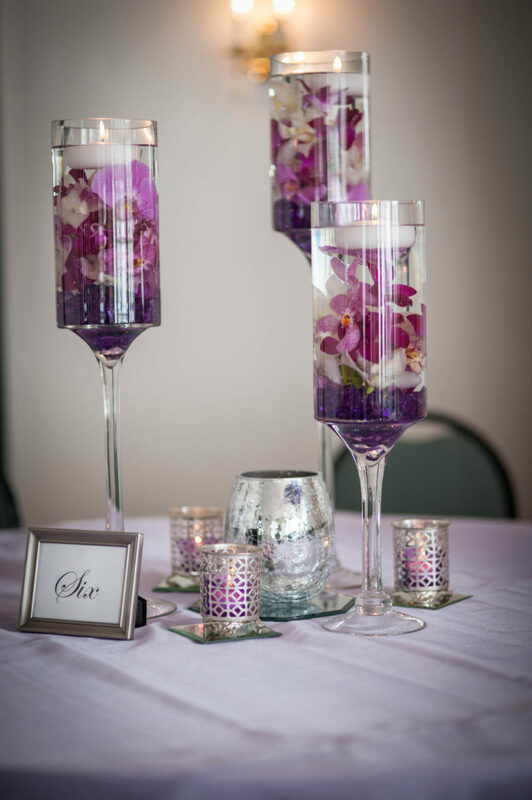 I first came across Dianes’ artistic creations about three years ago when she displayed samples of her work for one of our vendor tastings. 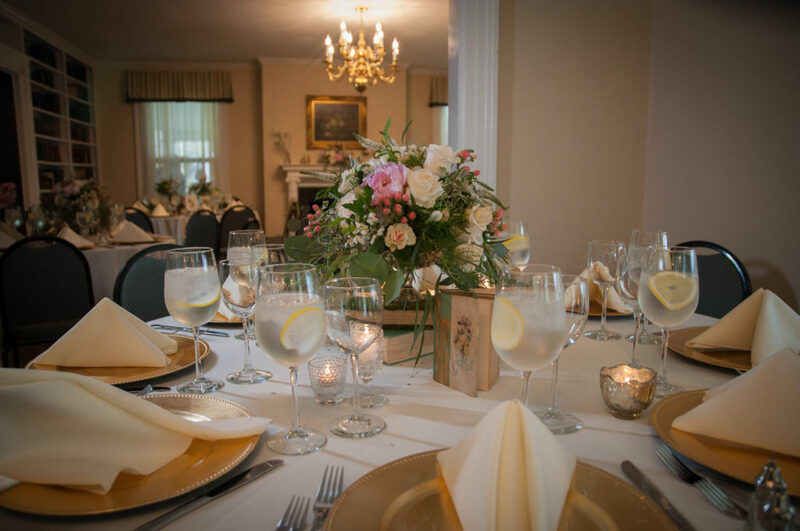 Upon doing more research discovered that Diane has been hired for Mansion events longer before I began my position as Tarrywile Mansion’s Event Coordinator a little over 5 years ago. 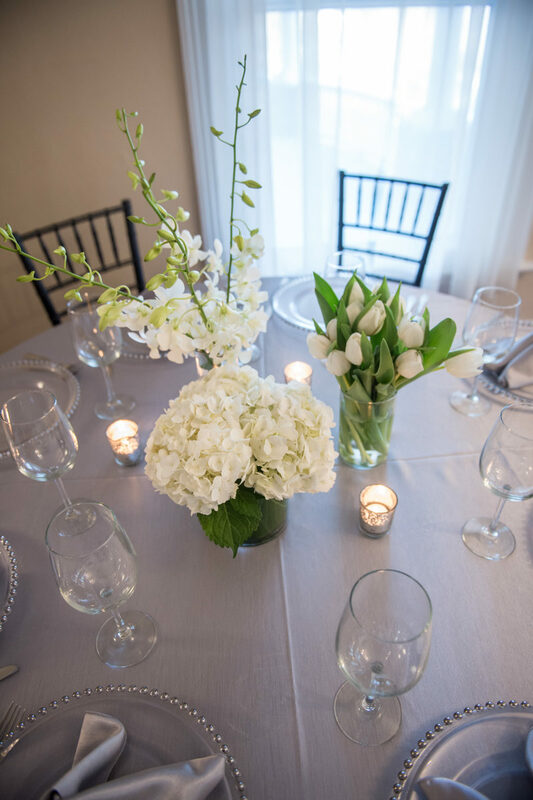 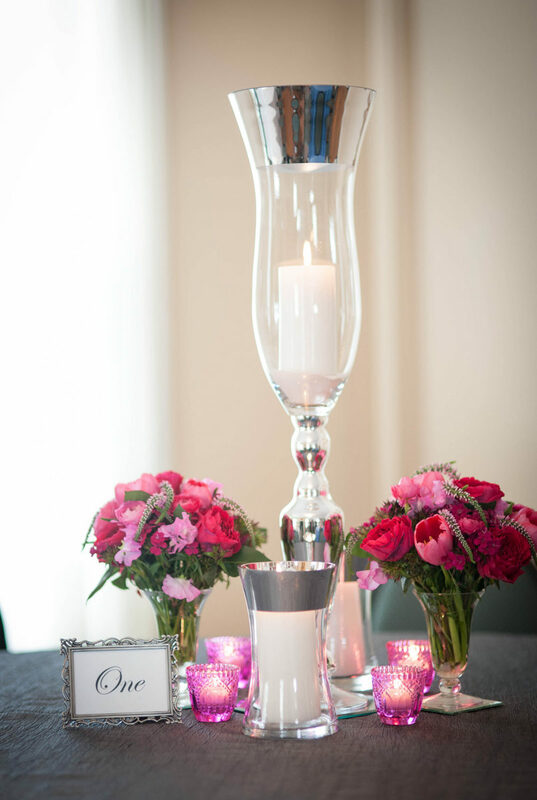 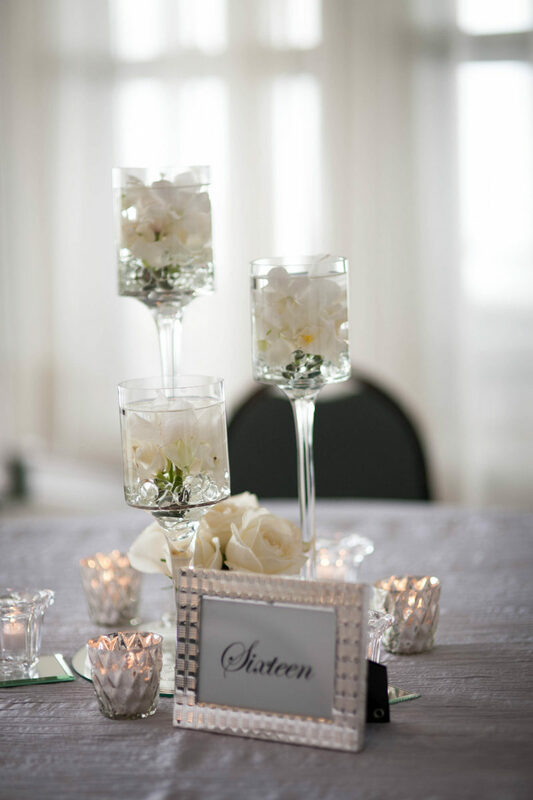 She has a dedicated staff of decor experts that will help you on the most beautiful day of your life. 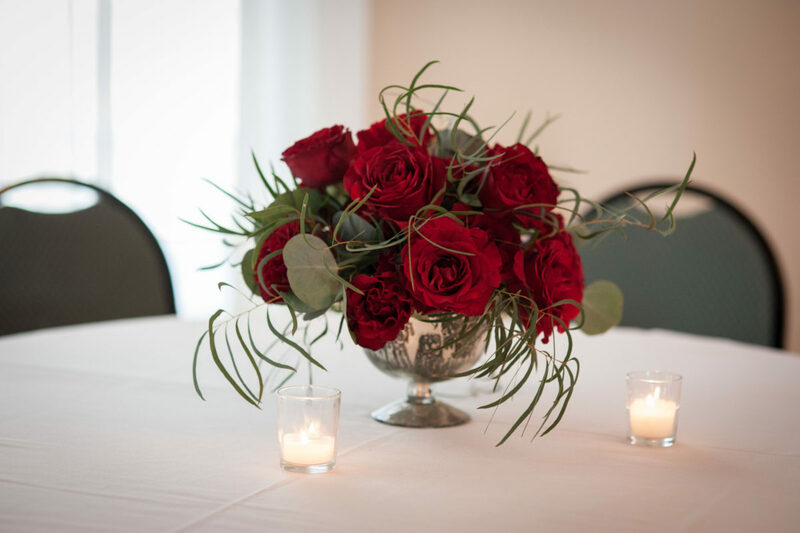 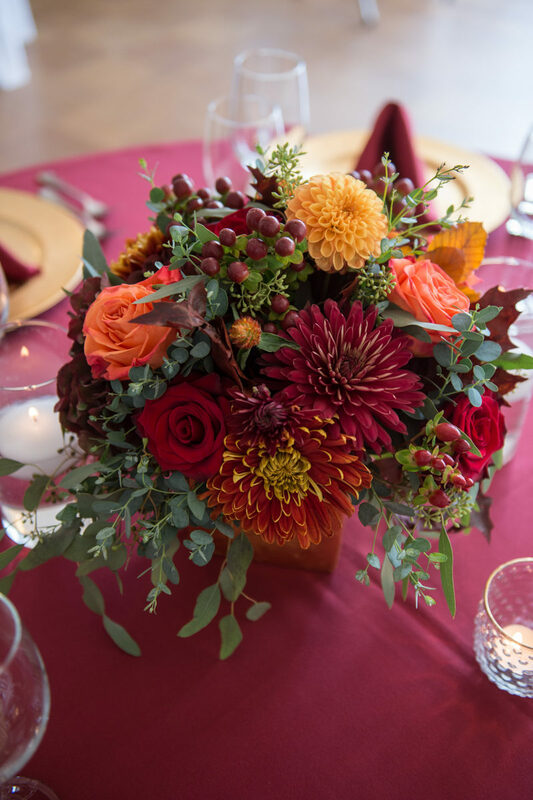 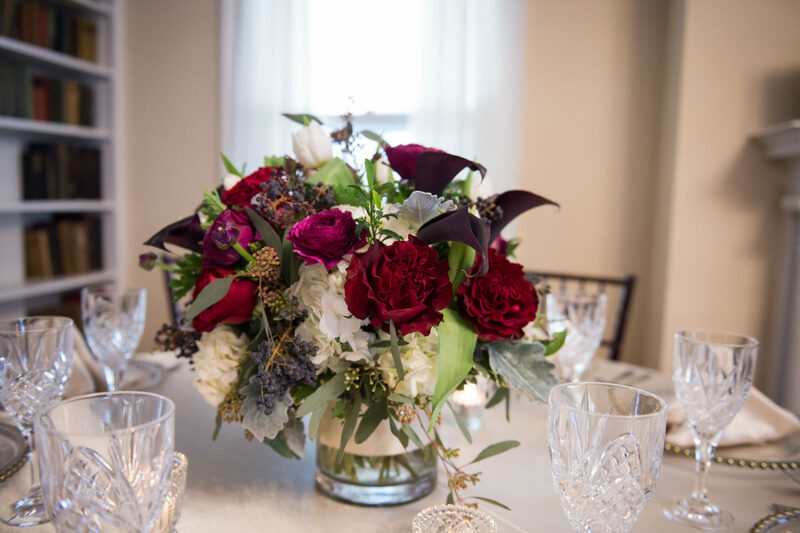 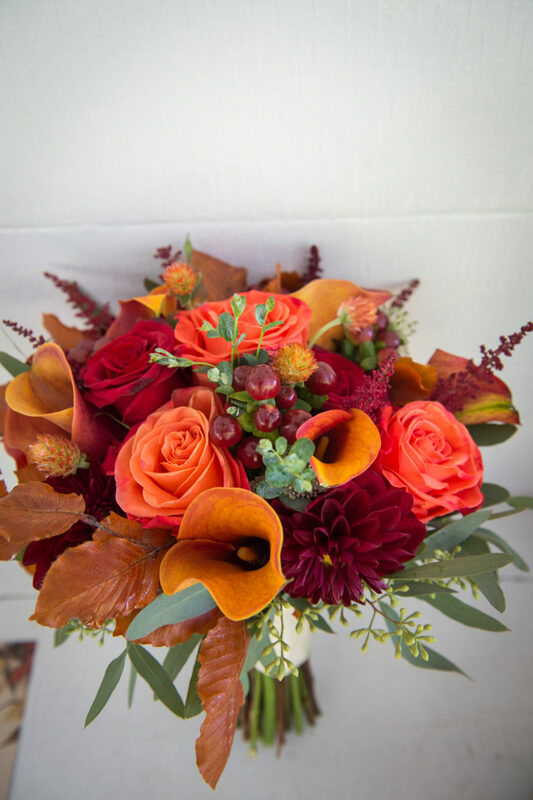 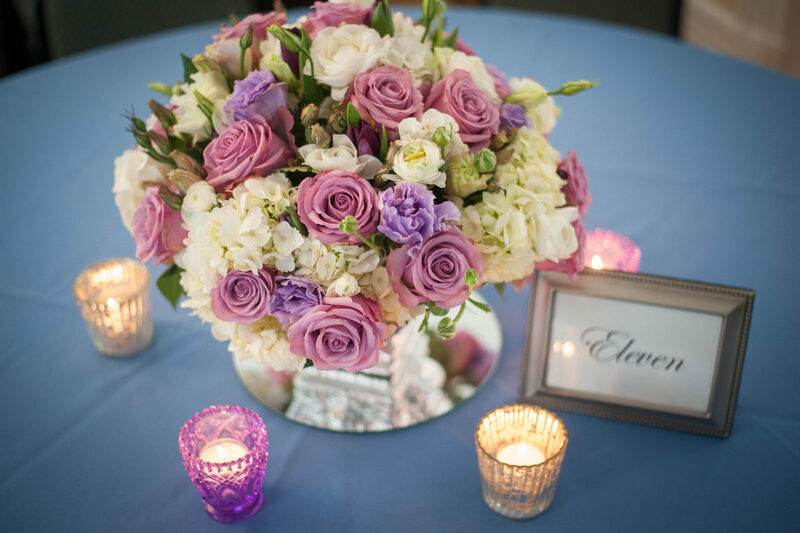 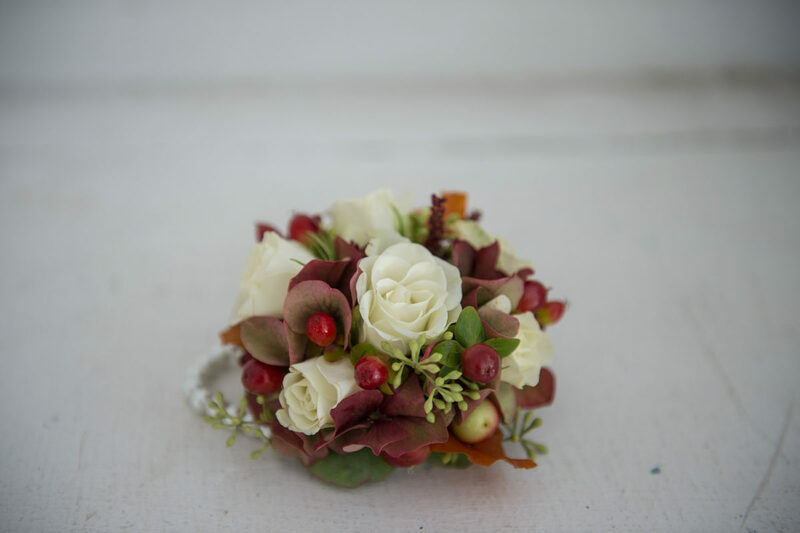 Diane has been creating custom floral designs for over 20 years. 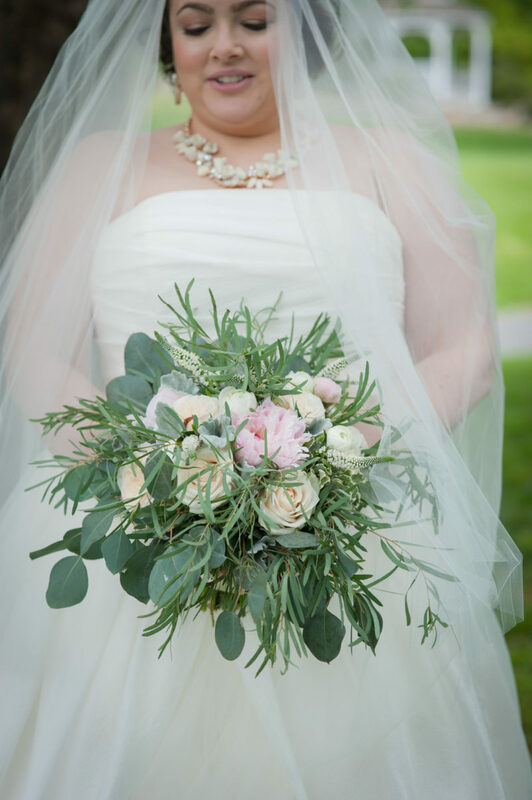 Her work had been featured in publications such as Martha Stewart, Grace Ormonde National, Style Me Pretty, Bliss Celebration, Brides Connecticut, Grace Ormonde Wedding Style New England, La Bella Bride, and The Knot. 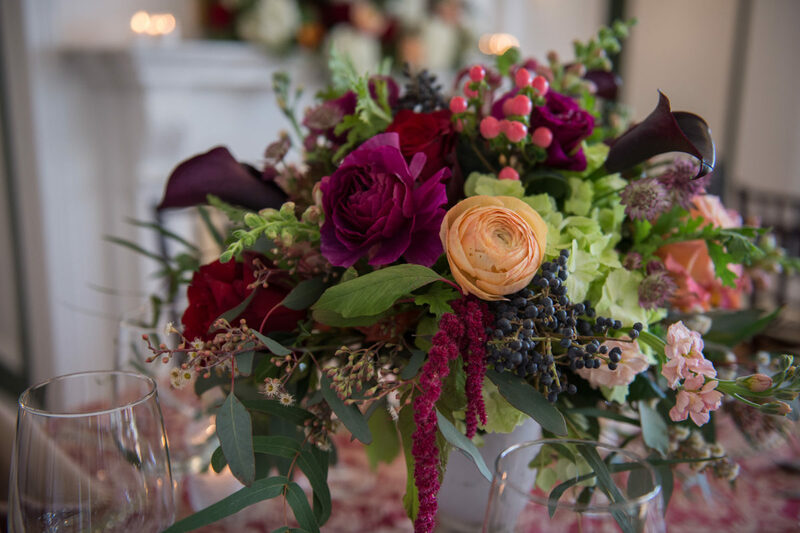 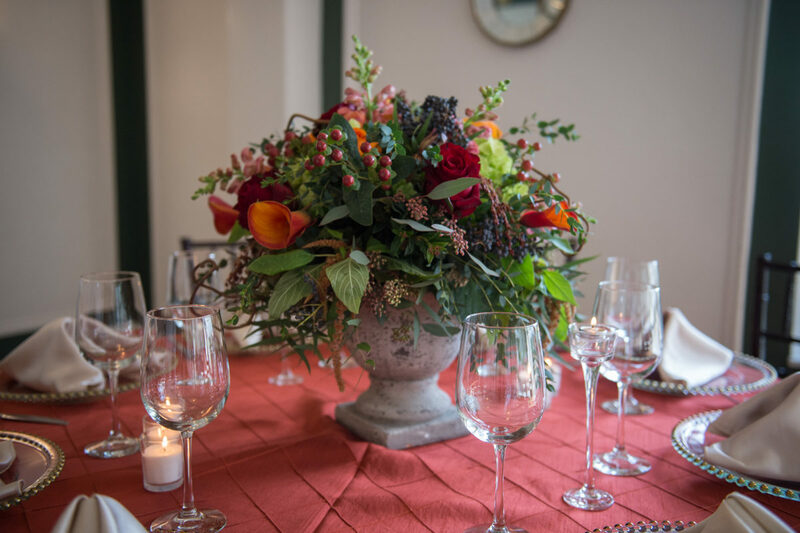 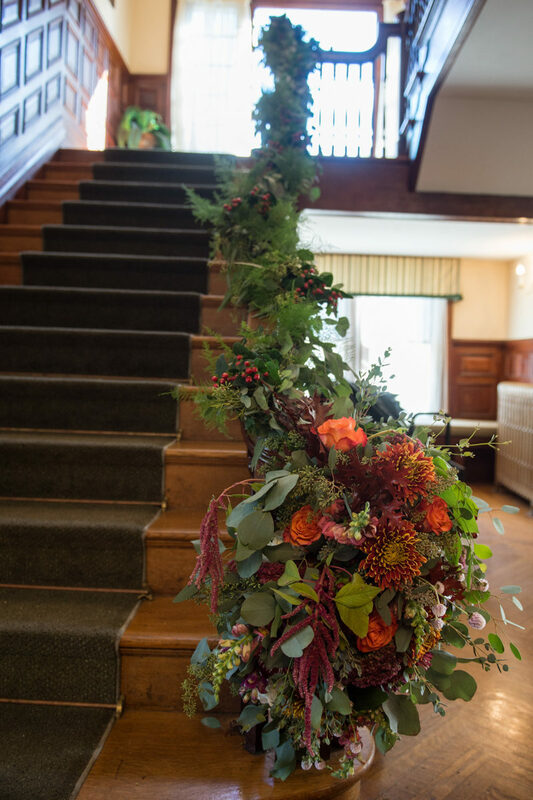 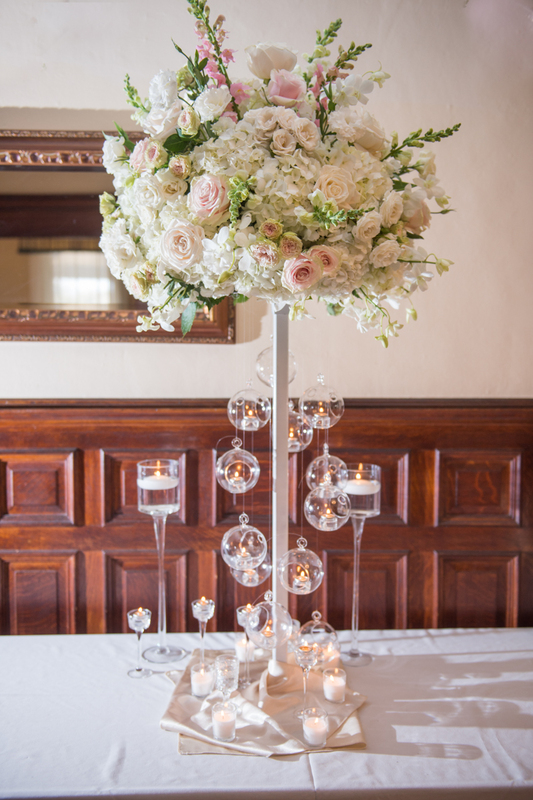 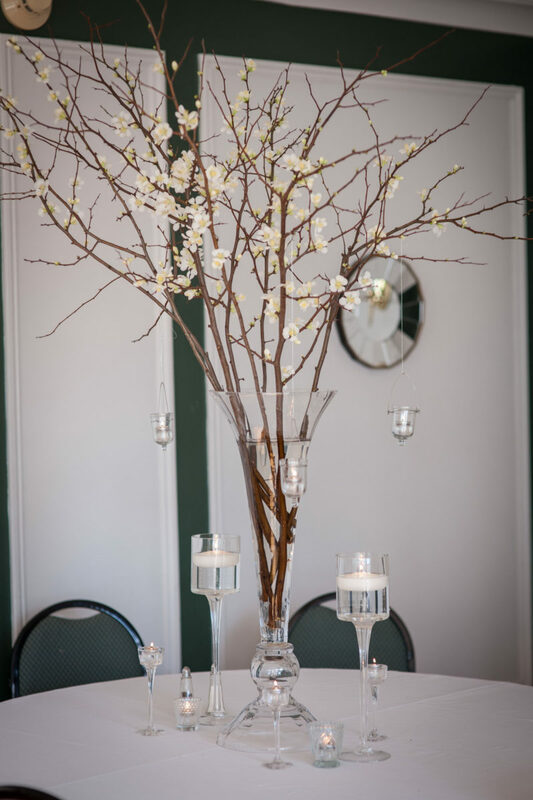 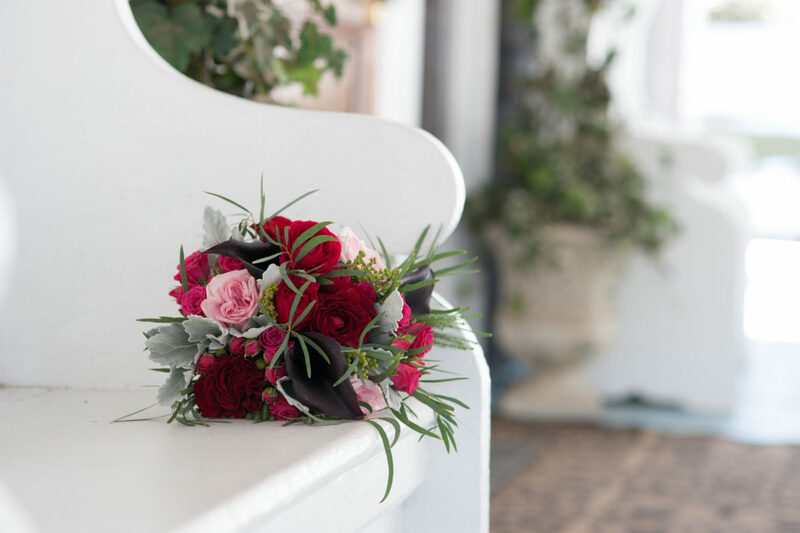 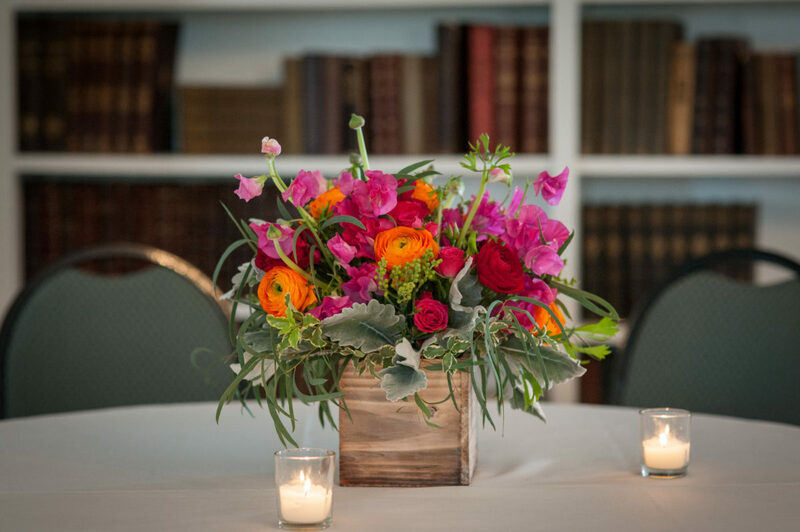 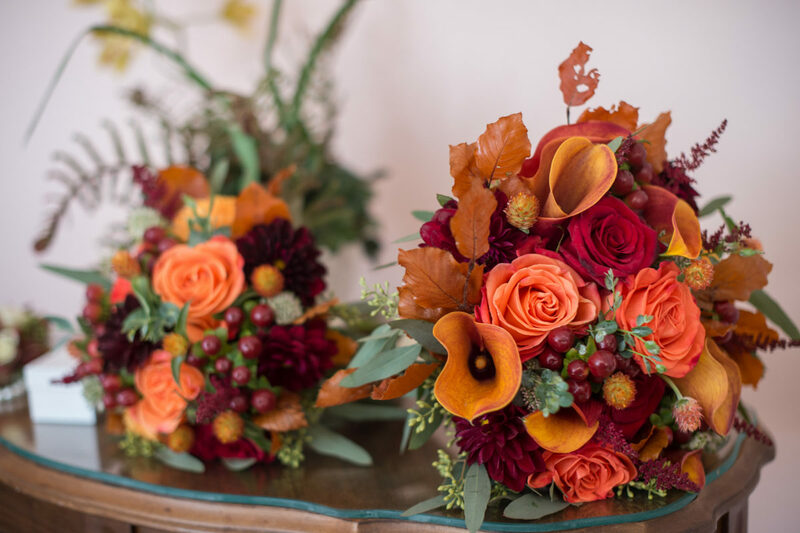 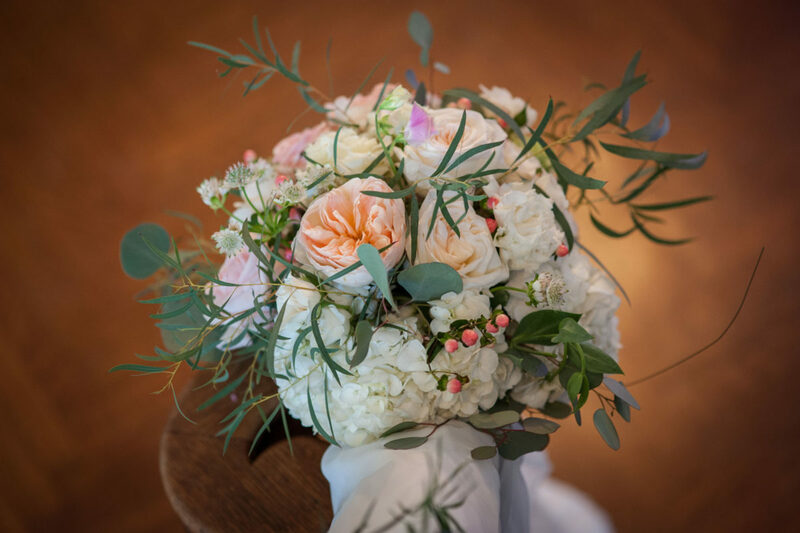 It’s a pleasure to have her floral designs gracing the pages of our website as well as Tarrywile Mansion’s social media channels; Facebook, Instagram and Twitter. 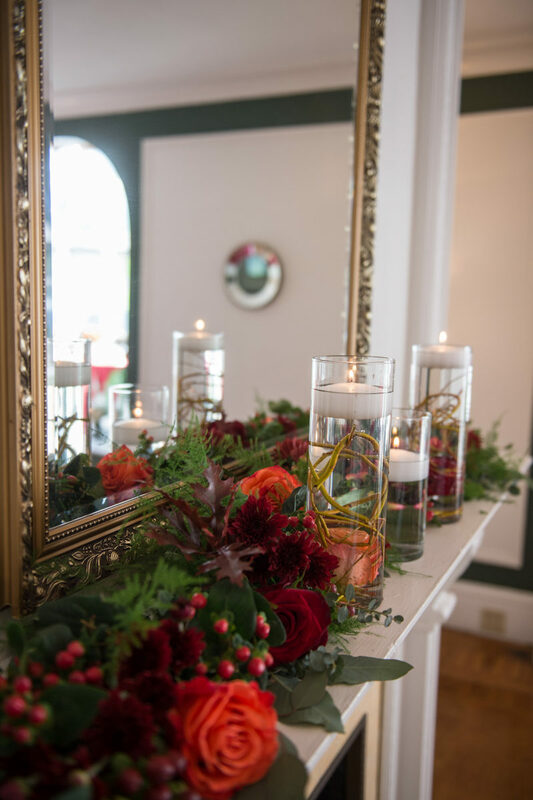 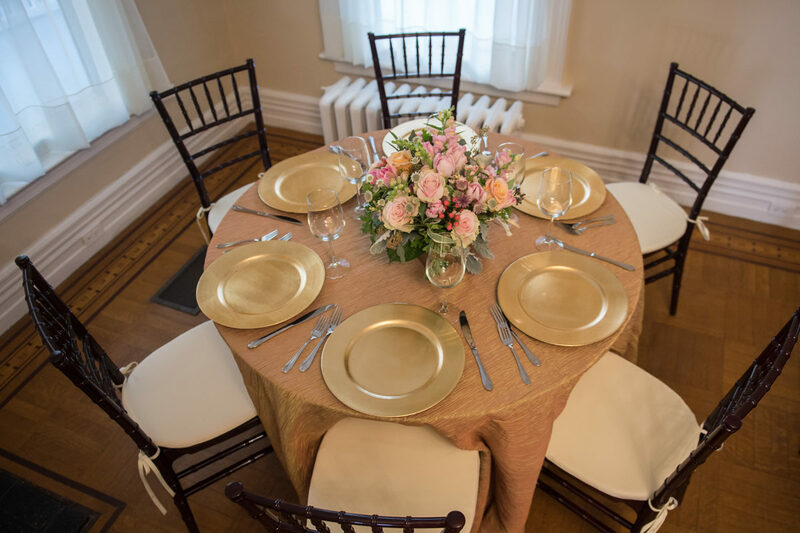 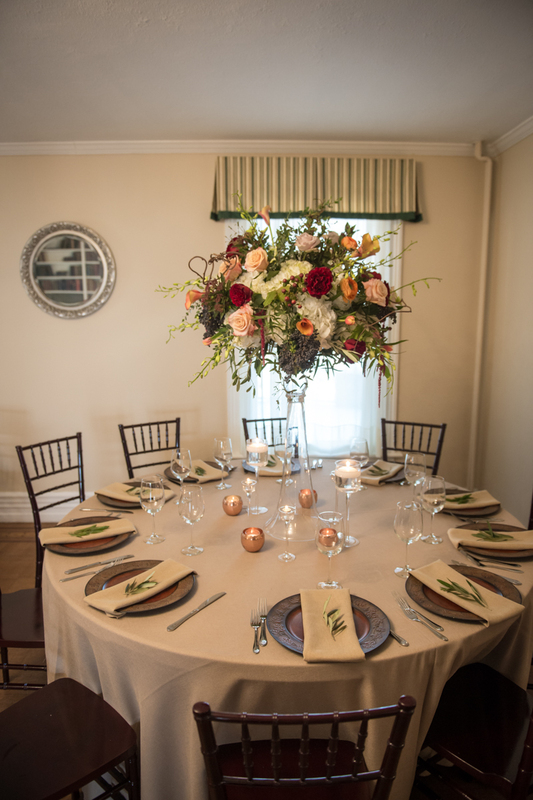 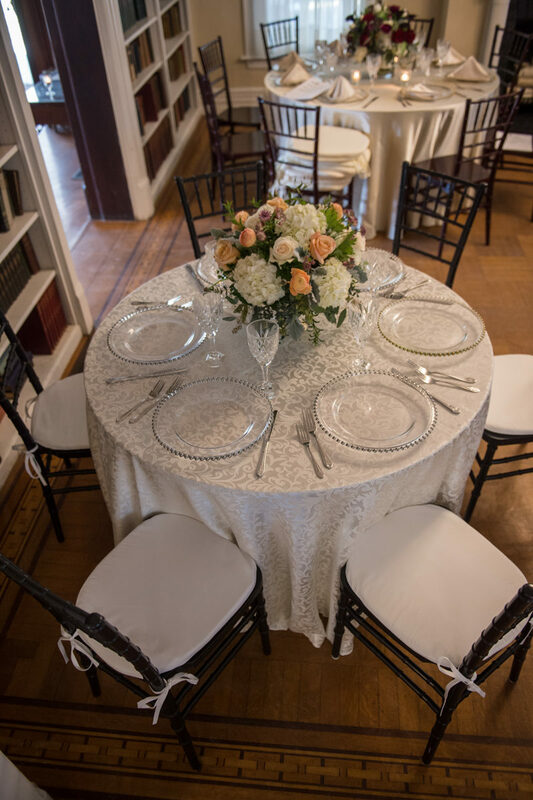 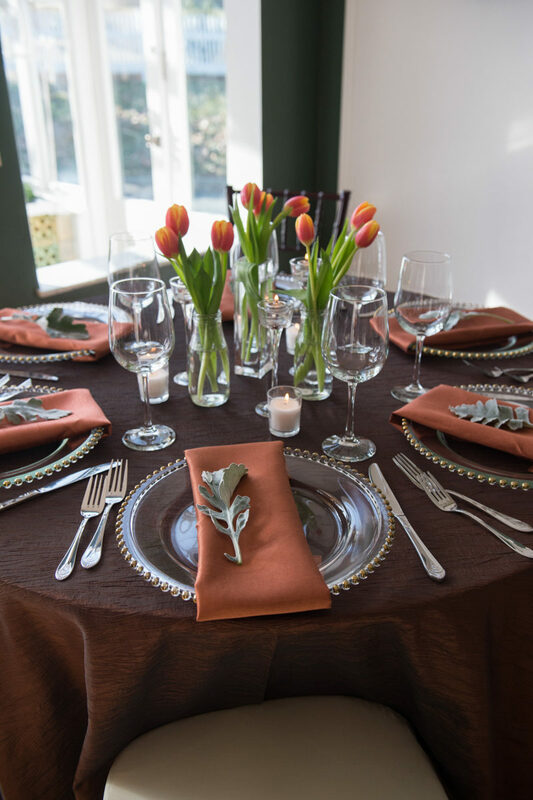 I always look forward to the events that Diane and her crew design for at Tarrywile Mansion. 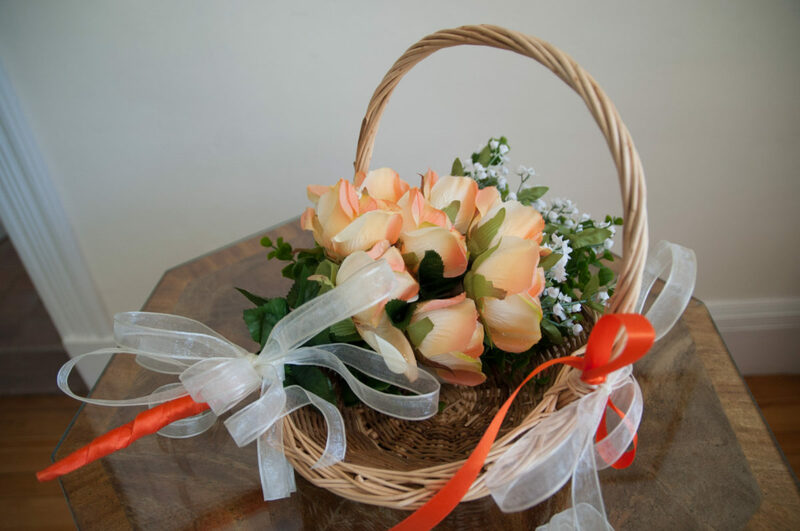 I’m guaranteed an office visit where I can take a quick break from work to have a nice chat with a lovely lady. 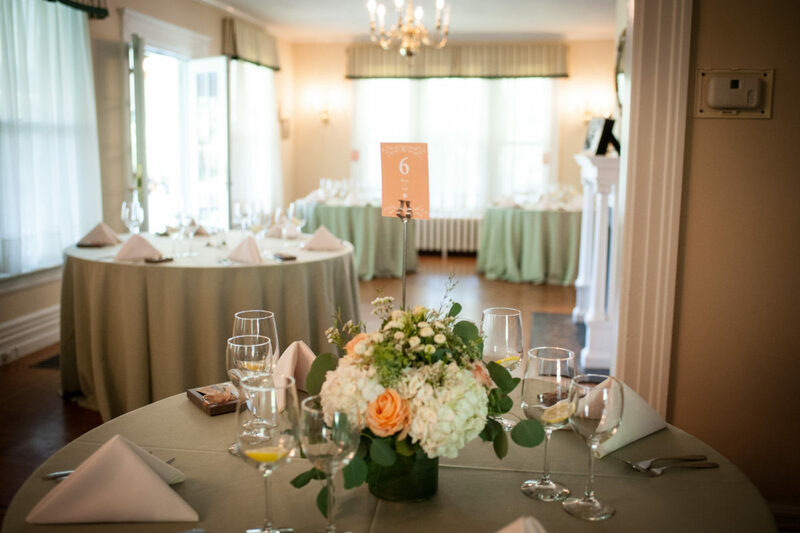 Diane never fails to ask how we are doing at the Mansion, if we’re busy or not, she asks after my family and relates the latest goings on in the event business. 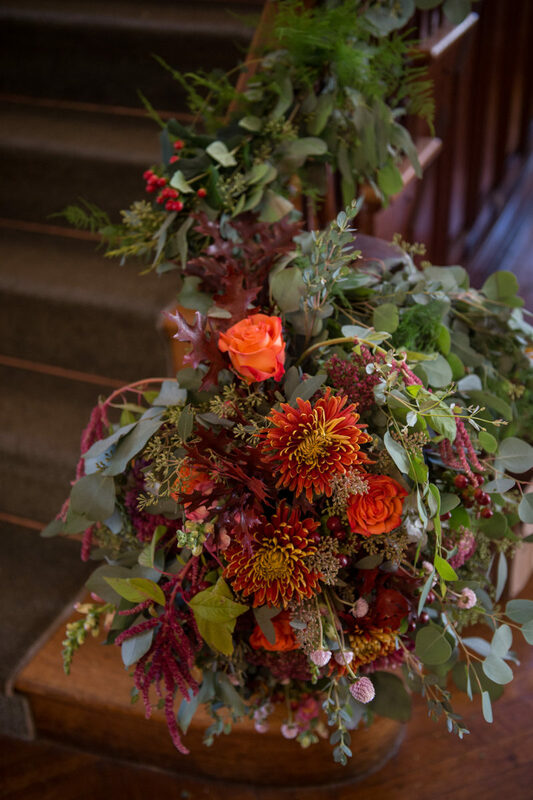 I’m always fascinated to see how her creative mind works as she uses various flowers (most I don’t know), colors and accessories the same way a painter wields a paint brush. 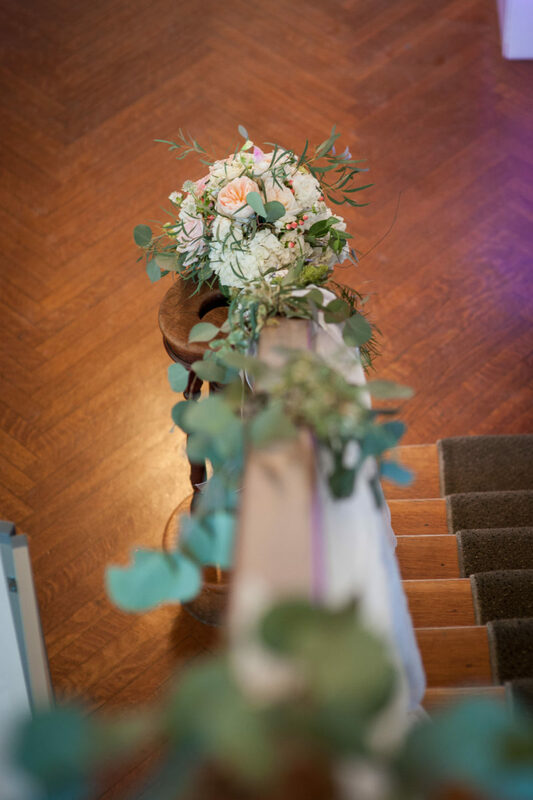 The end result is always a masterpiece. 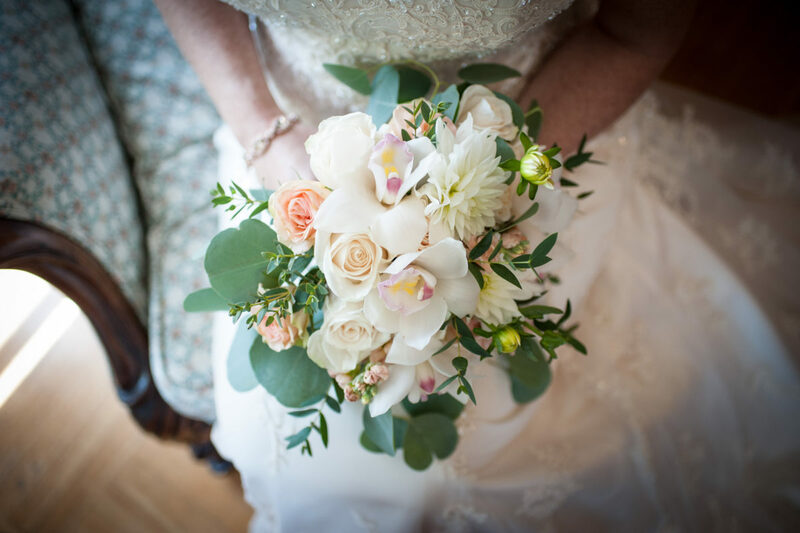 Diane is a true professional wrapped in a petite frame with a heart of gold and a soul of an artist. 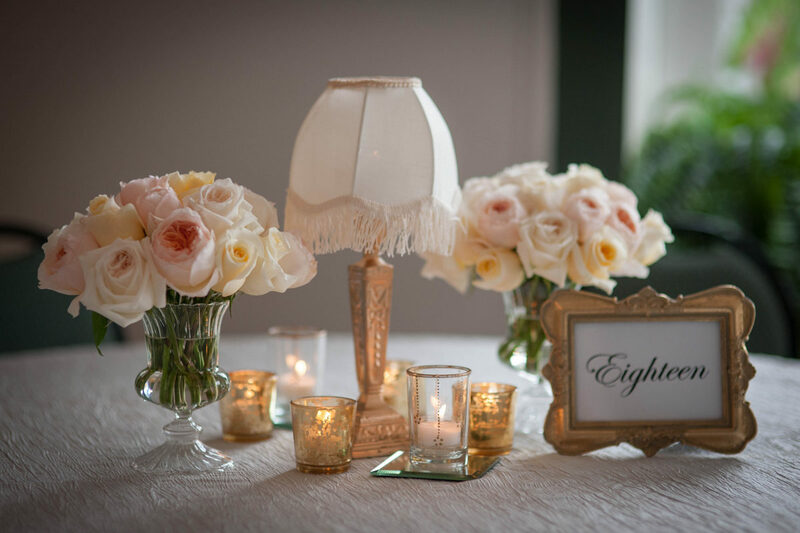 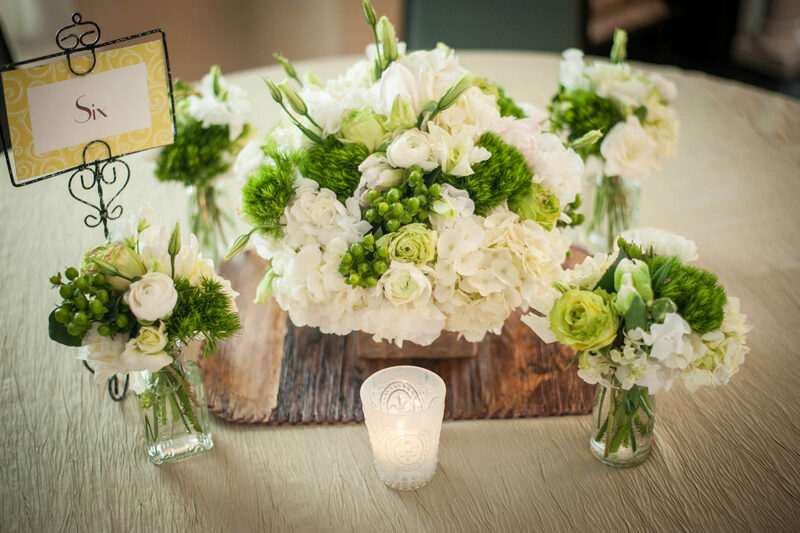 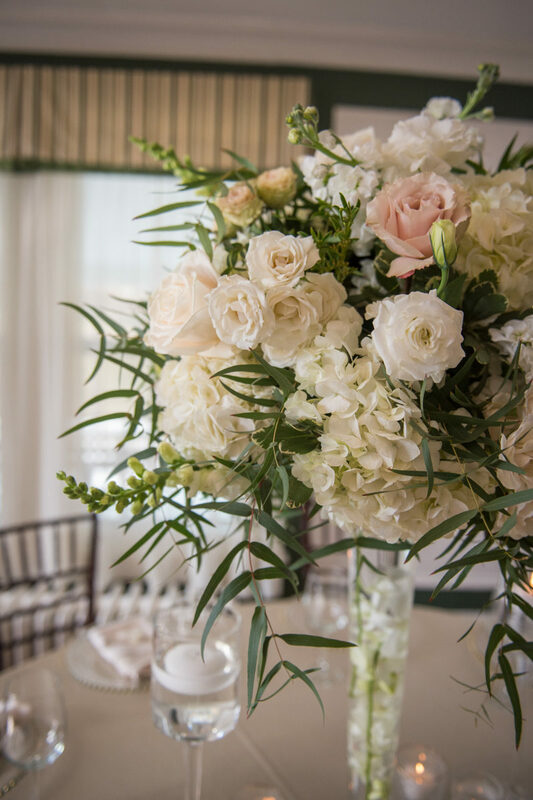 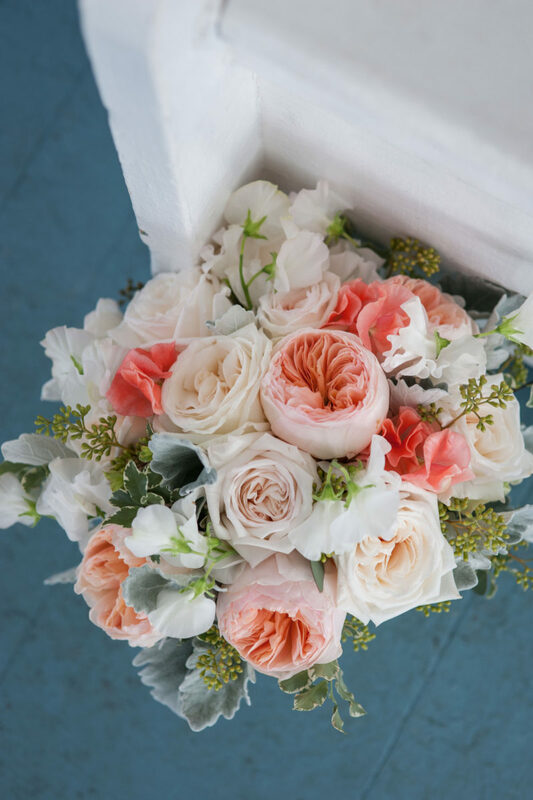 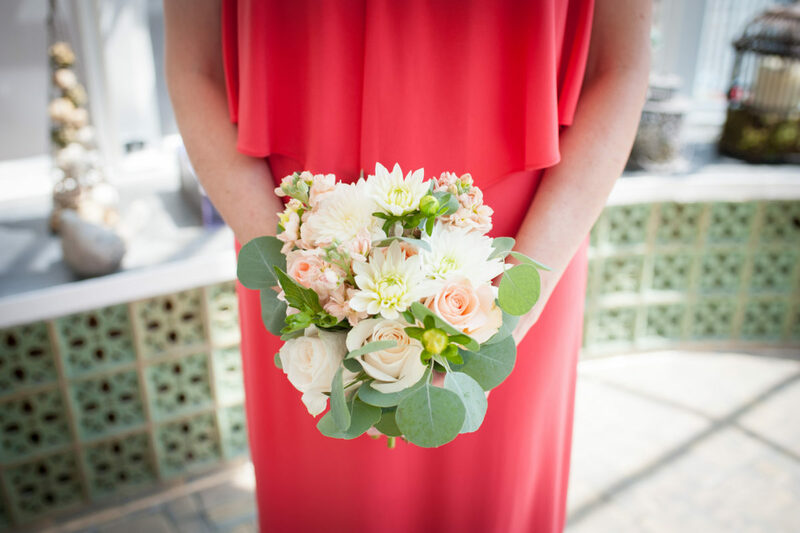 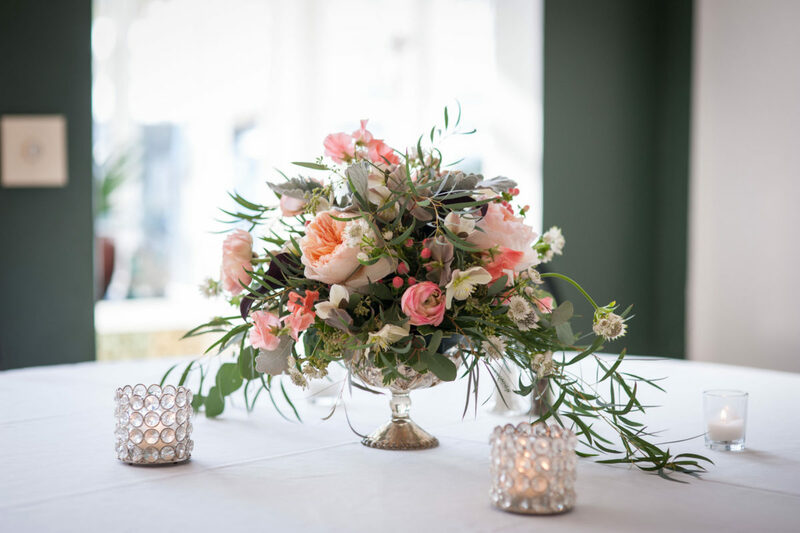 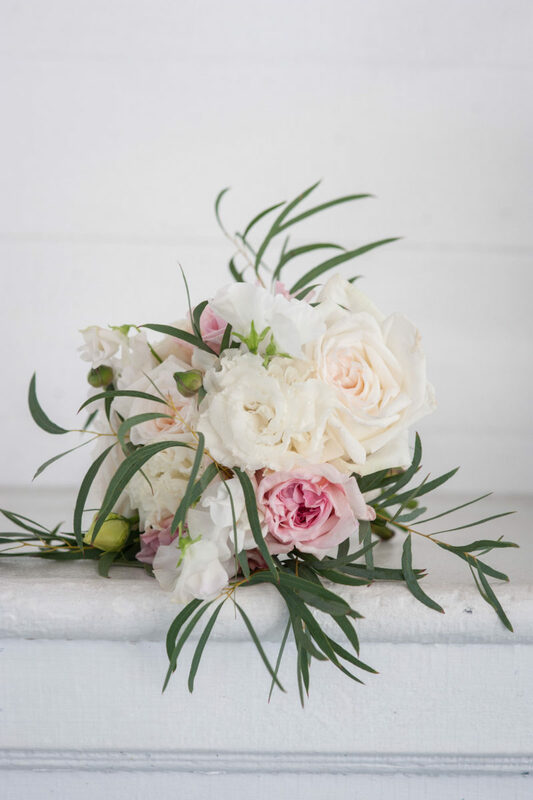 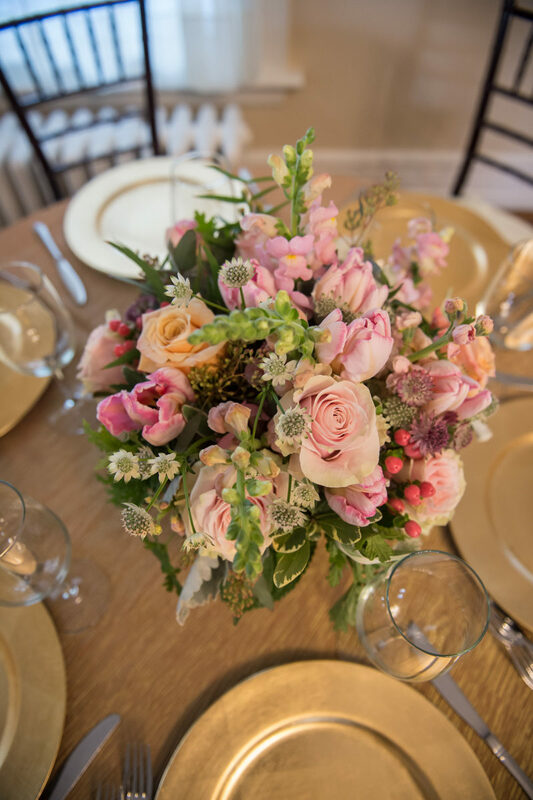 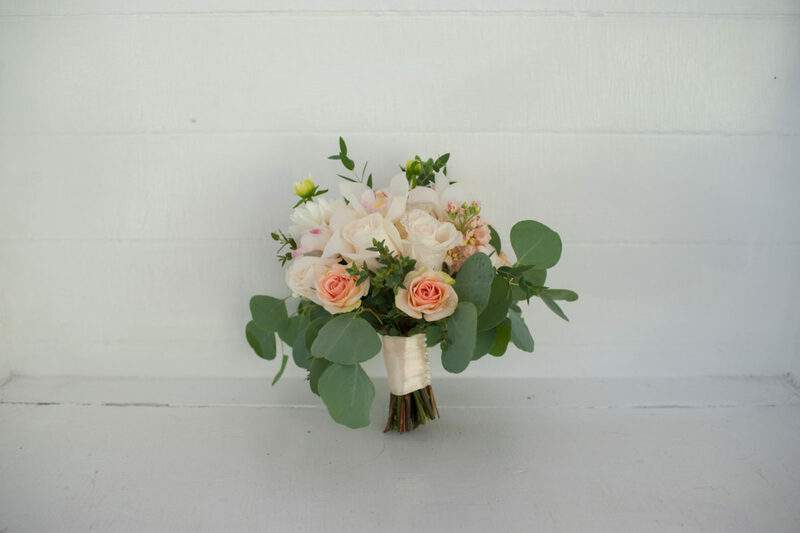 The floral designs for wedding of Erik & Dana combined the subtlety of soft pink, pale peach and white peonies (don’t quote me on the name of the flower) with a light sage green accent to bring together a beautifully romantic theme. 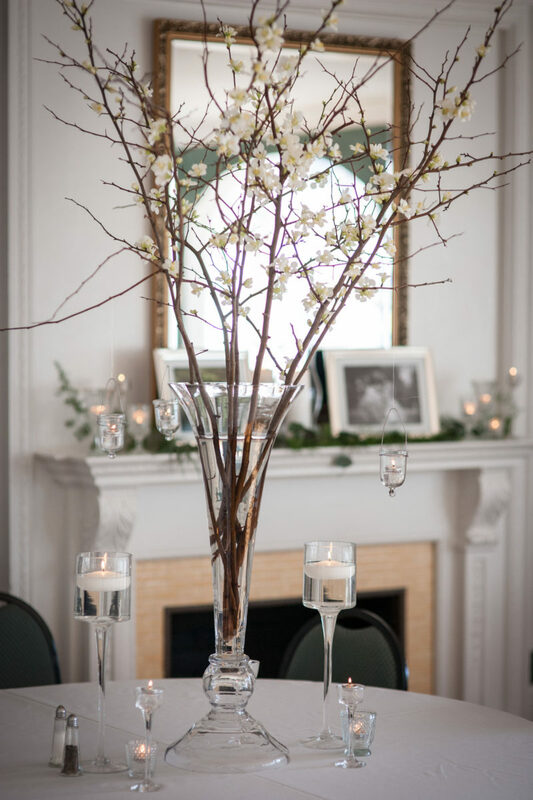 The centerpieces tied in an image of fairies and wood sprites with moss covered books and the continuation of the softly colored blooms. 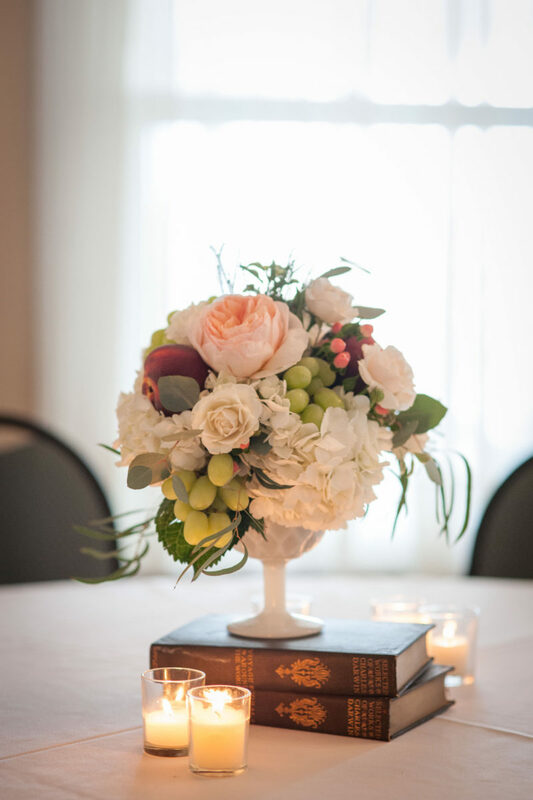 Each table had a different variation of books and flower arrangements. 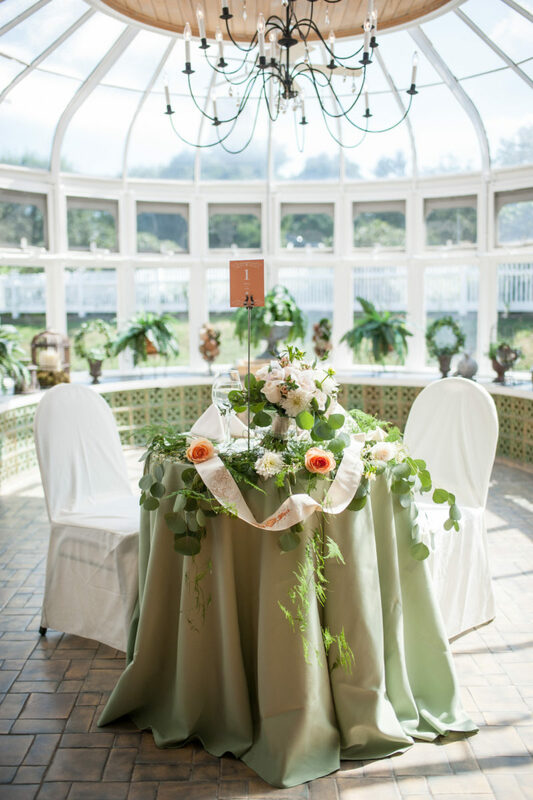 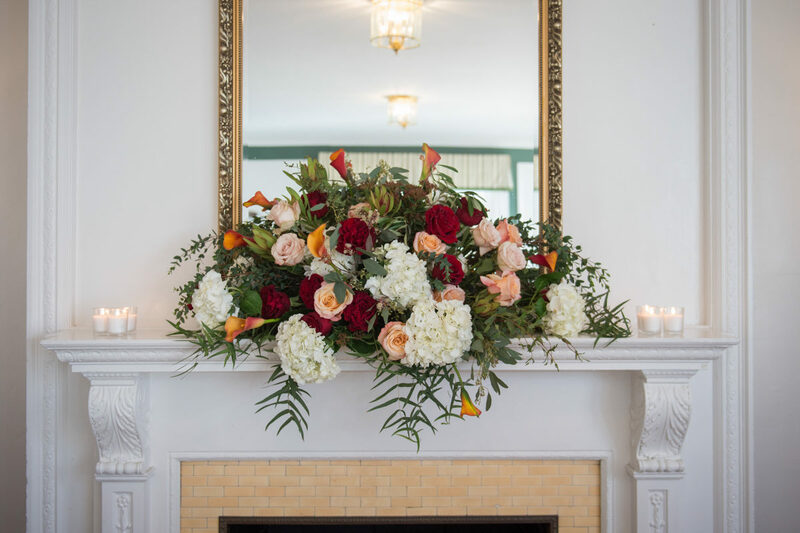 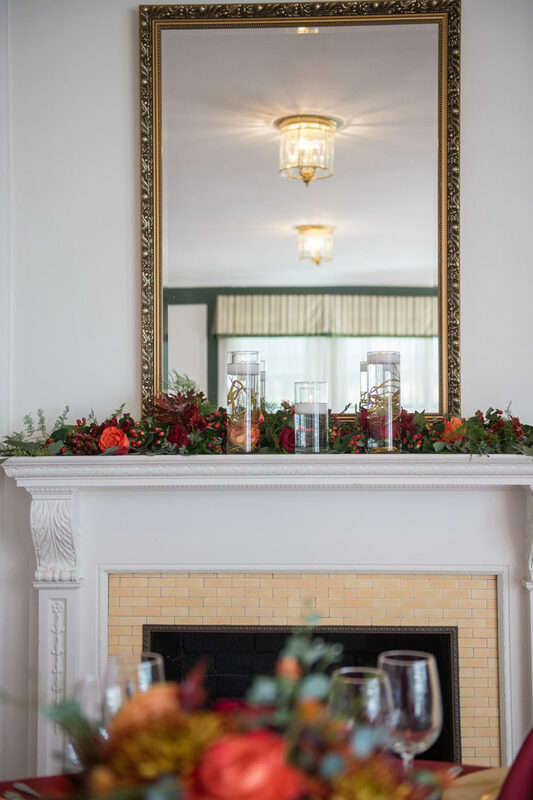 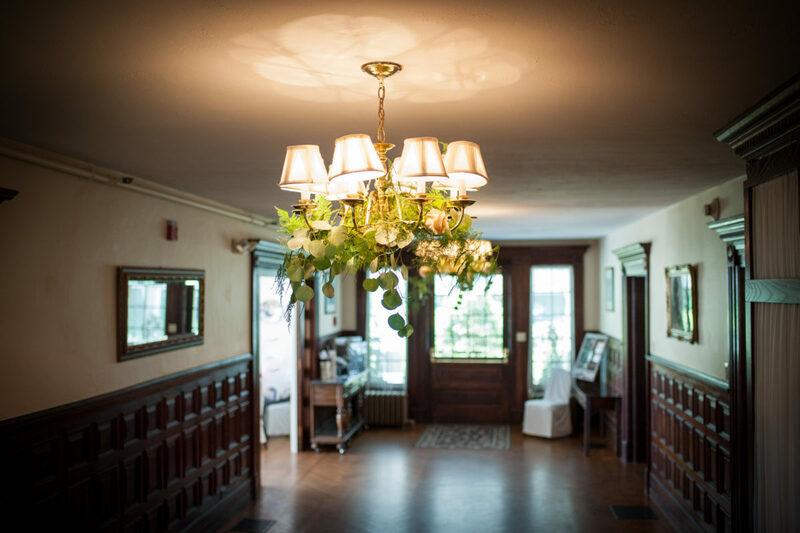 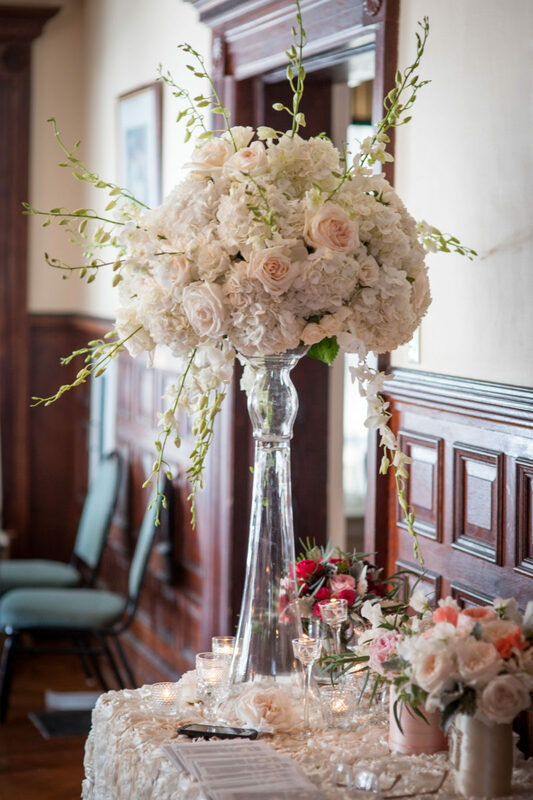 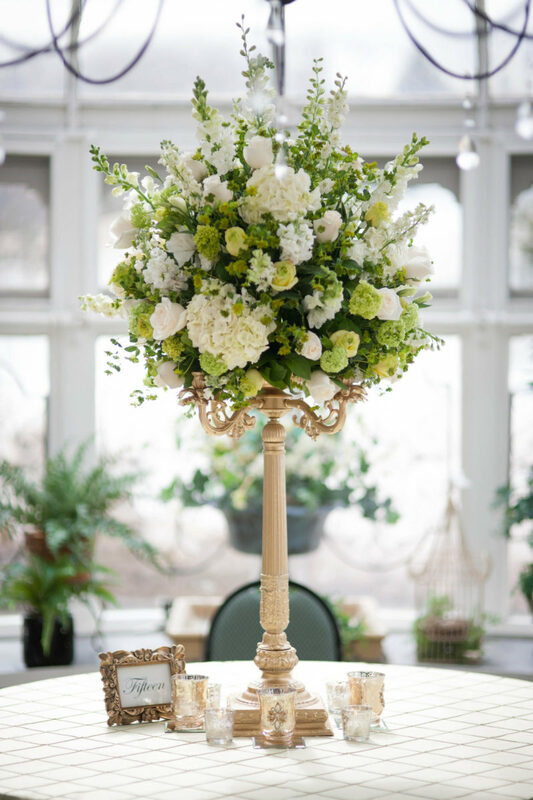 The mantels were decorated with flowing swags of opening blossoms carrying the theme through out each room including rings of flowers and greenery wrapped around the chandeliers in foyer and tall vases overflowing with white blooms on the veranda. 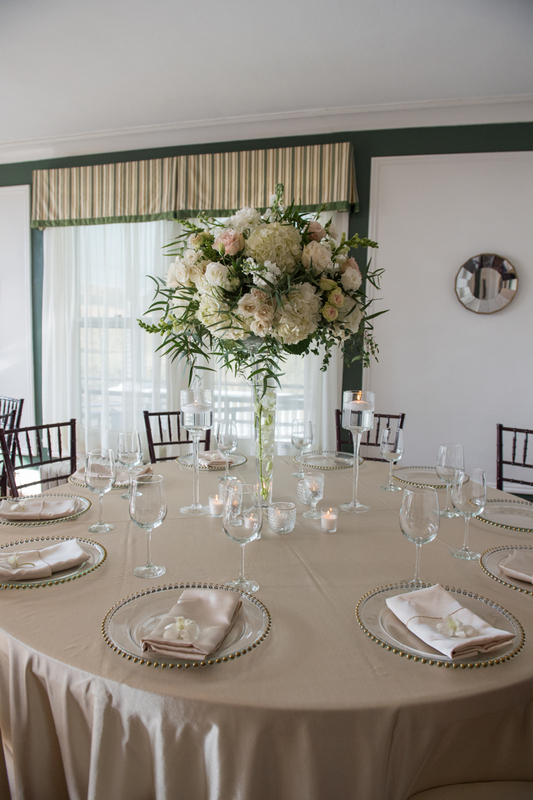 Marie and Erik went a slightly different route for their August wedding. 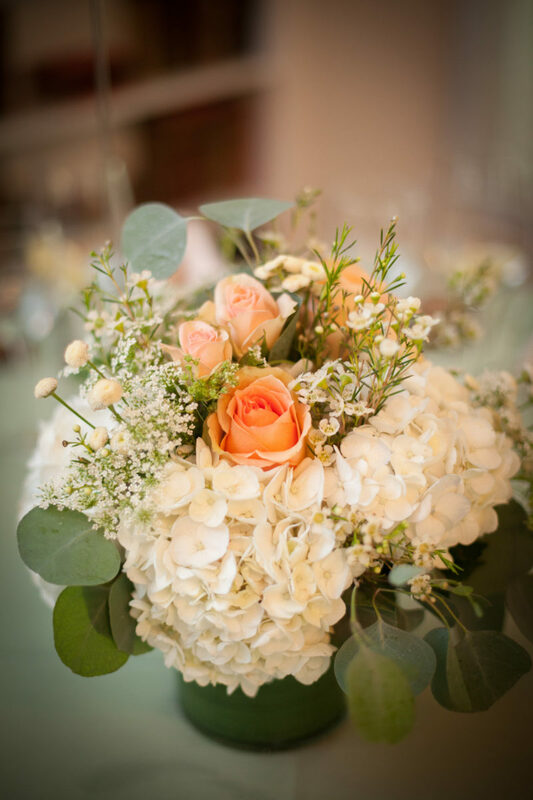 They chose a mix of blossoms including some pale, peach, almost white roses, soft peach blooms and white iris’s with a punch of amethyst. 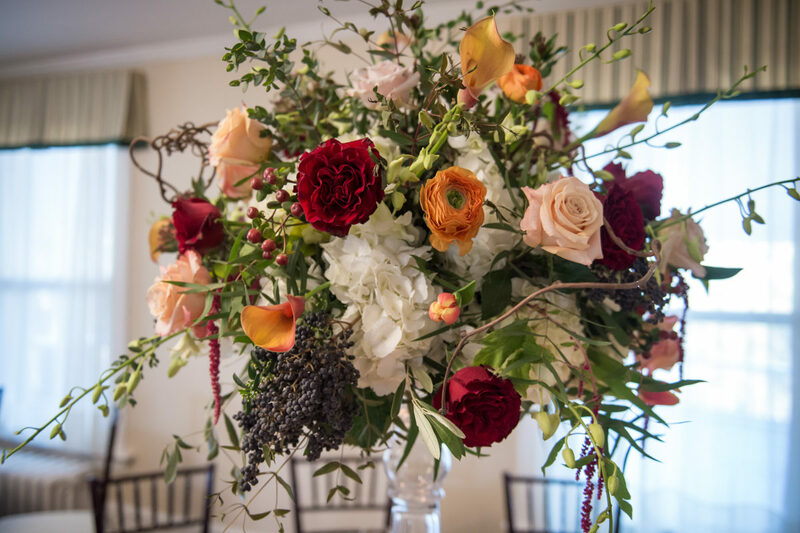 I am going to say right now that I am probably the least qualified to describe floral designs, all I know is the end result with Custom Floral Designs is always worth the investment. 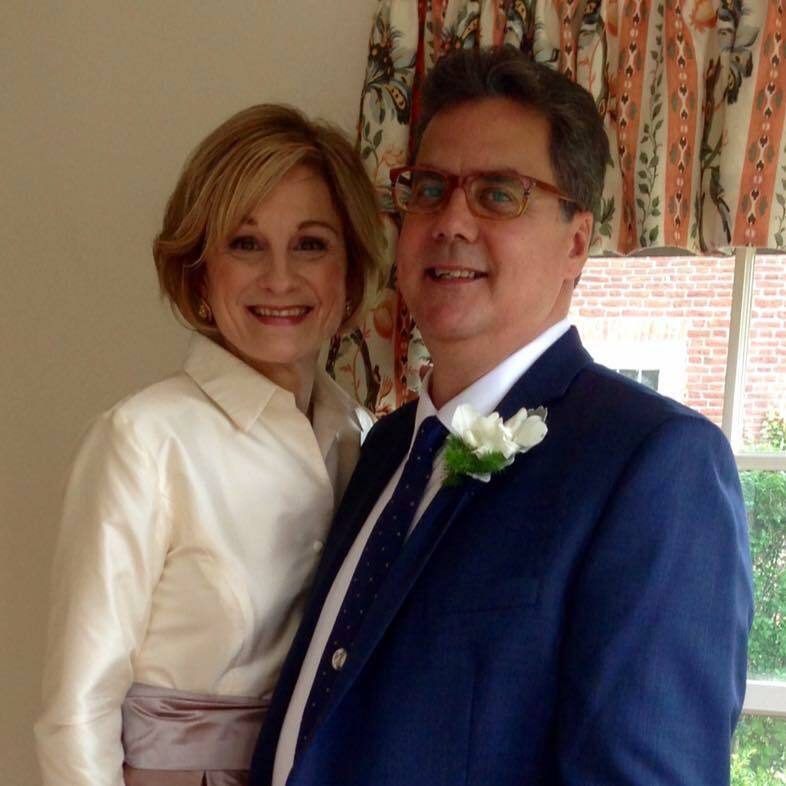 I will let you judge for yourselves. 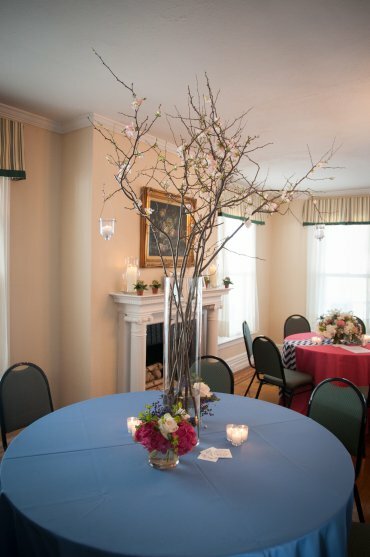 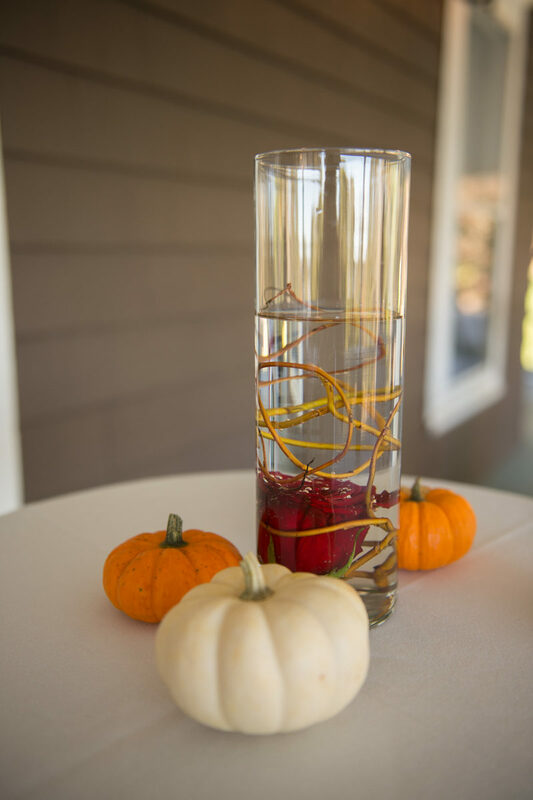 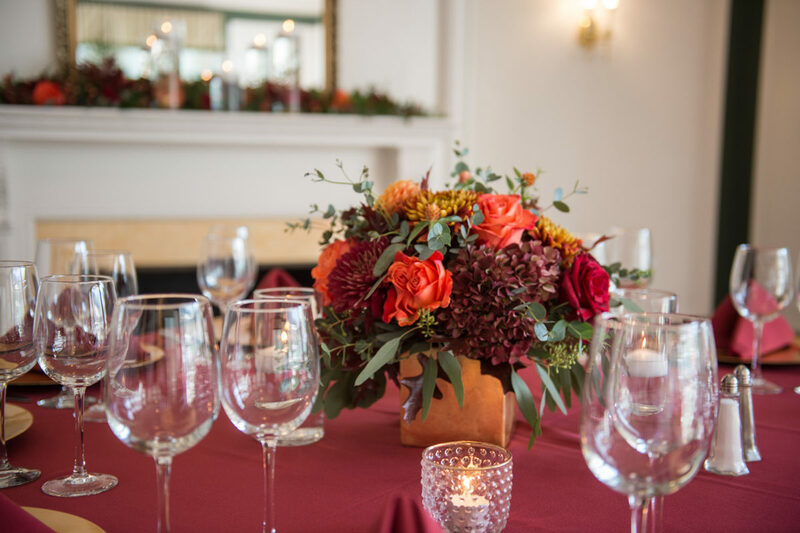 Diane and her crew have designed the decor for three Vendor Tastings as well as six weddings.